A CRM solution opens up amazing opportunities for small businesses and large enterprises alike to thrive. Now more than ever, businesses need to expertly manage prospects and existing customers with great care. Using a platform with the best CRM features is an essential part of that strategy, so we compiled a CRM functionality list to help you get started. Having analyzed dozens of different CRMs — and interviewed over 500 companies about their CRM needs — we know firsthand that there are many CRM functions and features you must consider before buying and implementing a CRM system. Check out the results of our CRM selection survey to find out more. Choosing the right CRM for your organization is crucial to customer success. At its most basic, it comes down to two key points. To select the right CRM, you need to: 1) get familiar with the features of CRM systems in order to choose from them and 2) know what specific CRM capabilities your team needs. To cover the first issue, below is a comprehensive CRM functions list for your perusal. We’ve also built a convenient CRM list to help you determine your requirements. Keep in mind that not all platforms are going to have this full list of CRM software features so you need to define your requirements and do some research. Note: This CRM functionalities list is in no particular order. It’s a compilation of the basic CRM functionality available across dozens of the top CRM platforms. Contact Management. Contact management is an element of CRM that sometimes goes by customer management software. This allows users to segment your contacts into groups to organize and better cater to them. With this CRM capability, you’ll be able to gather crucial customer data and bolster your marketing strategies when introducing new products. It also improves the personalization of all contacts with customers, making them feel important and catered to. This is a key factor in customer satisfaction! Sales Team and Customer Opportunity Management. Quantifying the opportunities that your sales team has with customers is a relatively basic feature of CRM. Referred to as lead scoring, it allows users to identify the customers that are most likely to convert. This helps streamline sales/marketing teams, improve efficiency and optimize your sales process. Lead Management for Determining High-Quality Leads. No CRM feature list would be complete without mentioning lead management. This technology allows a business to determine the best customers to follow up with based upon demographic and psychographic factors. Like lead scoring, it improves the efficiency and productivity of your sales team by helping them focus on the right leads at the right time. Reports and Dashboards. Once relegated to business intelligence tools, BI, reporting and dashboards have become some of the top CRM features. Users can view statistics in a highly visual, engaging perspective using customized reports and dashboards. They offer real-time data updates and a platform that can be accessed from various portals, improving ease of access for a variety of personnel. Management can use these reports to make data-driven decisions — an investment in CRM BI is an investment in the future of your business. Sales Analytics. On the subject of reporting, sales analytics is one of the most valuable features of a CRM. Users can create better sales campaigns in the future by analyzing the hard data of past campaigns. CRM helps you collect data from social media, polls and website traffic, then analyze it — all with the same software. Mobile CRM. Everyone has a smartphone these days, so it makes sense to utilize the amazing technology inside them to benefit your business. Take customer relationship management on a remote device using mobile CRM programs and apps. Staff can view data and receive valuable alerts about campaigns on a mobile device. Sales Force Automation. Another of the many functions of CRM software is the ability to automate certain aspects of your sales process. This includes outgoing calls and follow-up campaigns, as well as the organization of data for more effective future campaigns. Automating these repetitive tasks allows your employees to devote their time and focus to more complex tasks. Sales Forecasting. A large part of customer relationship management is determining a metric for success. Forecasting lets you create a benchmark by which you can determine whether your results are actually on par with your efforts. You can also use this data to determine where you need to direct future efforts. Email Client Integration. You can now gain all of the automation and the organization of a dedicated email client inside of your CRM user interface. Don’t depend on Outlook or IBM notes — find a CRM that will do double duty for you. Then when a customer calls needing support, your reps can easily pull up their previous interactions and information to give them the best care possible. Workflow and Approvals. One of the ways in which your company will instantly increase its efficiency is by optimizing workflows. CRMs can facilitate optimization by automating processes like data collection, data analysis, marketing campaigns and other tasks that were previously done manually. They also offer reporting and analytics to help users identify problem areas in order to improve them. Sales Data. One of the best features of CRM software is its ability to organize your sales and customer data into manageable chunks. Once raw data is stratified, it can be developed into visualizations you need to make decisions. Users are able to quantify KPIs, identify pain points and make data-driven decisions. CRM Data/File Storage. In order to maximize the usefulness of data, it must be properly stored. One of CRM’s key features is a proprietary method of data storage so users can pull up the data in an efficient manner. CRMs also offer safeguards to protect and backup this important data to prevent losses and security breaches. Files Sync and Share. CRM software functions as the synchronization platform for many of your outside programs. Upload emails from Outlook, sync with Google Drive, import spreadsheets and more. Because of the sharing features of CRM, you can view all of your feature set from one platform. 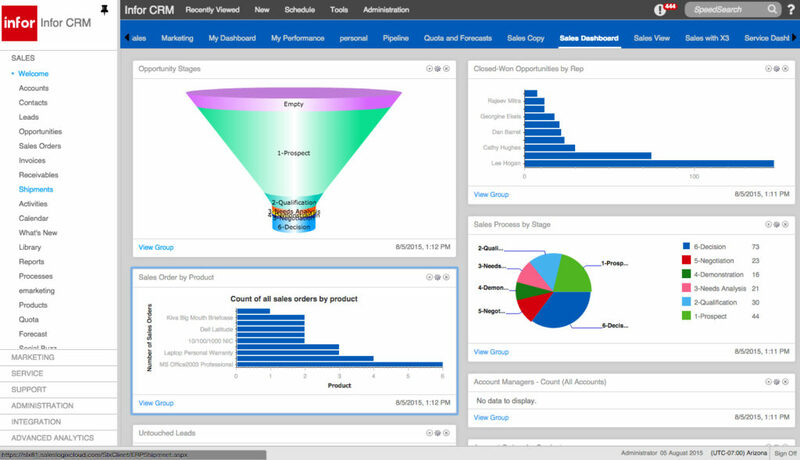 Inside Sales Console. The platform for increasing sales performance through a more efficient UI is known as the inside sales console. CRM systems offer optimized UI and data analytics to further streamline and improve the customer experience. Sales Performance Management. Among other CRM system features, sales performance management offers a range of benefits to sales teams. Managers can easily see what aspects of the sales team are performing well and which need improvement. Data can be organized by sales rep or by other quantifiers. You can manage the performance of sales partners from the platform to ensure your team is performing at its best. By identifying problem areas with concrete data, they can be more efficiently addressed. Marketing Automation Integration. Marketing automation allows you to more efficiently and strategically target audiences that are likely to be interested in what you’re selling. A good CRM platform will allow you to control the terms of automating parts of your marketing program selectively. Chat Integration. The chat feature is priceless to a modern user. By integrating a chat program like Olark or LivePerson directly from your CRM software, you can chat with employees, partners and provide customer support, all from the same UI. Call Center Automation and Integration. One of the key features of CRM is the ability to control your call center from your CRM UI and integrate any third-party program into a single platform. The fewer different systems you use, the less likely you’ll be to get confused and lose information via translation or transfer. Web Analytics Integration. Integrating web analytics doesn’t just allow you to collect data on who is visiting your website. It analyzes that raw data, identifies problem areas, suggests ways to improve and provides insights into the way your user base interacts with your website. CRM systems provide intuitive ways to collect and access these statistics from your UI. Support Automation. Customer support features like FAQ pages, chatbots and email correspondence is becoming increasingly automated as AI databases improve. Users can control the output of your customer support features from your UI. Cloud-Based or On-Premise CRM. CRMs come in several different formats — web-based, also known as SaaS or online CRM, or on-premise. On-premise CRM systems use a network of highly-customizable onsite hardware and software systems that require software licenses to store customer data. Cloud CRM solutions exist on remote servers where software updates, security measures, hardware upgrades, backups and more are managed by the CRM software service provider. Both come with unique pros and cons to consider before choosing. Product Level Quotes. CRM software functions as an inventory database for your products. Keep up with quotes for the products that you sell individually. Find out which products are doing well with customers and where sales are lost. Access this information from handheld devices, desktops and more. Role-Based Views. For added security, you can restrict your employees’ access based on their role in the organization. Control what different users see within your CRM to prevent data leaks and security breaches. This allows you to manage your employees’ activity based on level and keeps your customers’ data safe. Testing Environment. This functionality of CRM refers to user’s ability to test new capabilities before rolling them out. Your employees can get used to handling the changes, customers can explore and give feedback and you collect data on every interaction. This helps prevent customer frustration, improve conversion rates and help you make educated decisions and actions. 3rd-Party Integrations. No CRM processes list would be complete without mentioning integrations. If you use any other kind of software — ERP, BI, HR — you’ll want to be able to integrate it with your CRM. Integrating other programs to your CRM software allows for added functionality and streamlined operation. Campaign Management. 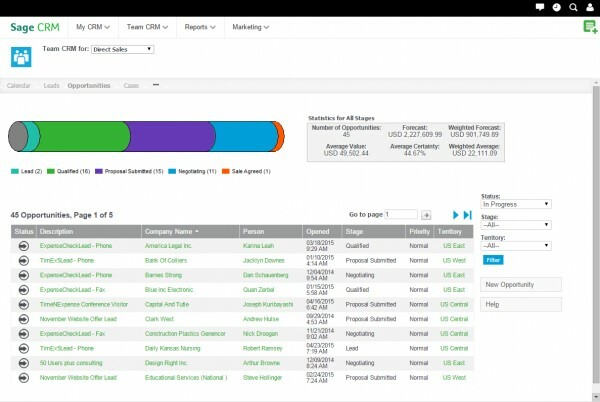 Campaign management features allow you to manage your entire sales campaign from a single UI. This includes campaign ROI, scheduling, analytics and more. CRM software combines analytics tools with data collection software, then gives you and your employees numerous access points. Customization Options. Customization is one of the more basic CRM software features, but it has far-reaching implications. The more customization, the more flexible the CRM. It’s crucial to know your needs when it comes to customization before making a purchase. Will the software grow with your organization? Does it have the capability to adapt to and integrate with existing software used by your organization? Can it incorporate desktop productivity tools? Can it change when you need it to? If you answered no to any of these questions, you may need to find more flexible software. Email Marketing Integration. Some businesses will be content with the email marketing features of customer relationship management software, but others may find they need the more robust power of a separate email marketer. If you already utilize an email marketing system like MailChimp or Constant Contact, you may prefer to integrate it rather than import that information to your CRM. Most of the CRM products on the market will offer this kind of integration, but it’s important to double check. Social Media Management Integration. Dedicated SMM efforts can be managed from the CRM UI. Integrate management platforms like Oktopost and Hootsuite to streamline your social media management and allow multiple team members to work together from different access points. ciently to improve customer satisfaction levels with CRM. Track, close and reopen existing cases with this useful feature. Online case management also allows you to manage any confidential information in a secure environment. You can ensure your customers’ and leads’ sensitive information is kept away from prying eyes that might use that data for identity theft or other harmful activities. This is essential because it helps you avoid cybersecurity issues and data leaks. The last thing any business needs is to get in trouble due to data security issues! We wanted to know more about which CRM features and functions users really want, so we asked over 500 companies in the market for CRM software what features they wanted in their CRM platforms. Buyers need to be more educated about what functionality they should expect from CRMs. Buyers are looking for features that improve the communicative and collaborative capabilities of their organization both internally and with their customers. Most buyers expect some automation included in their CRM capabilities. They want integrated, automated, comprehensive CRMs with features tailored to their individual needs. SelectHub interviewed 529 companies from small businesses to enterprises, from different industries, with different needs. But the same answers came up again and again. Intriguingly, many buyers asked for specific elements of marketing automation without asking for marketing automation specifically. For example, eight percent of respondents asked for campaign management or tracking capabilities. Of that group, 48 percent asked for only campaign management with no mention of marketing automation. Marketing automation functionality including campaign features was important to 26 percent. Then, 23 percent asked for campaigns and marketing automation as distinctly separate features. This suggests buyers are fundamentally confused about what is typically included within standard sales force and marketing automation functionality and how to communicate about what they need. Additionally, while 14 percent of respondents requested basic sales force automation, others requested only specific elements of sales force automation functionality, or requested sales force automation and a feature that what would be included in any sales force automation package. Here’s an example: of the 13 companies that said they wanted forecasting, 76 percent didn’t mention sales force automation. They just listed forecasting and other typical sales force automation functions of CRM as areas of interest. Then, 24 percent said they wanted forecasting and also wanted sales force automation, suggesting some buyers don’t know the difference. Looking at the buyers who requested reporting capabilities reveals a similar dilemma. The fact reporting was requested by 22 percent of users and analytics by eight percent goes back to the root of buyers’ desire for better understanding of their business. But many respondents used reporting and analytics interchangeably, which isn’t exactly correct. They’re similar, but have some key differences. People want to be more educated about what’s happening in their business and want to know how to make it better. But there is still some basic education that needs to happen among business owners and operators to accurately determine what they need from a CRM. Hopefully, next year there will be fewer buyers shopping for new CRM solutions because their previous solution didn’t suit their needs. Communication makes and breaks relationships in our personal lives, and it should be no surprise that the same is true of business relationships. Buyers want to improve their relationships with their customers, and having better communication (both internally and externally) is one way to accomplish this. A contact management system gives colleagues access to the same database, promoting collaboration and communication between marketing and sales teams. Communication and collaboration were cited as significant needs by 36 percent and 38 percent of users, respectively, which helps explain the popularity of the contact management feature. Keeping track of contact information can also help streamline otherwise complex processes. Contact management functionality focuses on storing and organizing customer data like phone numbers, emails, addresses and communications with those contacts. It helps sales teams contact leads at the right stage of the sales process, and only contact them the appropriate number of times. Buyers want it to be easy for their users to collaborate: 10 percent listed a user-friendly interface as a top requirement. If their teams are struggling to properly implement the tool, then what’s the point of having the tool, right? This also ties back into the need for education. Two percent of users reported that their previous CRM solution was improperly implemented or too confusing to use, which is a pretty significant number. Users want a tool able to communicate and integrate with other tools they use. Whether those tools were email, an ERP, other CRM systems or a website, interoperability was a big bonus for most respondents. Integration removes steps in the pipeline process, prevents data duplication and consolidates customer data and sales processes. Buyers value centralized management, communication and ease of use, and it seems like they aren’t finding it in the CRM software they’ve been using. Getting everyone on the same page and fostering collaboration between marketing teams, sales teams and customers was one of the main concerns for most categories. We’re well into the 21st century — buyers don’t want to be doing tasks by hand that have been successfully automated. Remember how buyers were confused about what marketing and sales automation would give them? They still asked for these features and the functions related to them in huge numbers. 40 percent of respondents asked for marketing automation by name, and 14 percent wanted general sales force automation features. In fact, the top two through six features — marketing automation, contact management, reporting, pipeline management and sales force automation — were all automation related. Automation is valuable for more than just convenience, and buyers know it. It saves businesses time and money by taking over repetitive tasks and freeing up employee time. It makes them more efficient by optimizing workflows (requested by 12 percent of respondents). And automation promotes brand consistency and outreach standardization. A consistent brand and stable outreach is important to success. Buyers are realizing that one of the best (and easiest) ways to ensure streamlined and consistent outreach to leads is to utilize marketing automation. Marketing automation is especially popular with growing businesses because it standardizes elements of the sales process. Standardized email templates (requested by two percent of buyers), customizable fields (requested by three percent) and campaign management (requested by four percent) are all marketing automation features that focus on standardizing customer interactions. In the next few years, any business that isn’t doing sales force and marketing tasks with assistance from some kind of automation tool will be behind the pack — and the same goes for any CRM program that doesn’t offer them. Here’s a breakdown of the companies we surveyed. Most of the companies purchasing their first CRM system mentioned issues with organization, efficiency and communication as the driving factors behind their decision to make the switch. They are growing, changing or just ready to bring their organization into the 21st century. The companies looking to update were currently working with outdated, clunky platforms or had their data spread out across too many systems. These buyers wanted to consolidate disparate systems, organize their data and get everyone on the same page. 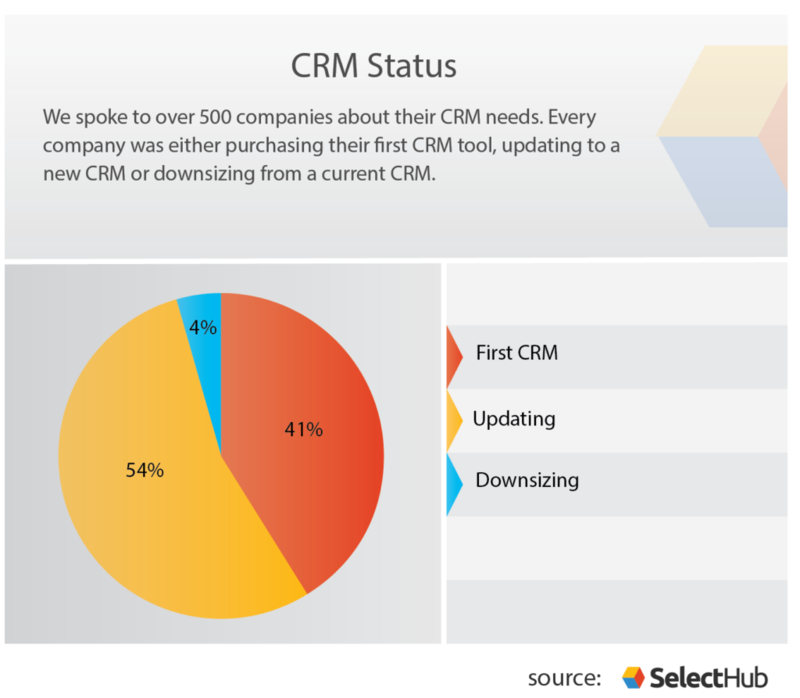 For the companies downsizing, they felt their CRM software was bloated with too many features. Most of these users also cited affordability as a major concern — they felt they were overcharged for services and features they didn’t use. The overwhelming majority weren’t particularly concerned with price point. They wanted to consider all their options and make a decision based on what would work best for their organization. The realistic consumers in the $50-$200/user/month category have a huge variety of options to choose from. Twelve percent of these buyers wanted to stay between $50 and $100/user/month, and 16 percent were comfortable with the $100-$200/user/month range. These companies value a balance between features and affordability. The user base hoping to keep their costs under $50/user/month were cost-conscious, typically smaller businesses or nonprofit organizations. Many users we surveyed in this category described their needs from a CRM technology as basic, valuing practicality over versatility. CRM platforms come in three forms of deployment: on-premise, cloud-based and hybrid. As you can see, most users prefer cloud-based systems. These platforms are accessible from multiple locations, tend to be cheaper and offer full IT support. Users who choose web-based CRM software can save money (and space!) by avoiding the IT-heavy physical servers required for an on-premise system. But cloud-based programs can get pricey if you realize you need more features or if the third-party host decides to increase the subscription fee. About a third of respondents said they’d be open to either on-premise or cloud-based CRM options. These people want to keep their options open and learn more about what specific vendors have to offer. If you’re one of those people, you can learn more about the pros and cons of both deployment methods. The three percent who prefer on-premise options unanimously cited their security concerns as a main motivation. On-premise CRM solutions tend to be more secure than those in the cloud — the more networks data has to travel through, the more vulnerable it is. A few users were curious about hybrid systems. They cited their reasoning as wanting the best of both worlds, and who can blame them? Despite their differences in size, budget and situation, these companies largely agreed on what features were must-haves in a CRM. The analyst team at SelectHub thanks them for their participation. Buyers want CRM software to manage their relationship with customers. The most desired CRM functions all came back to improving those relationships and making the process more streamlined. Buyers need ways to manage client information, interactions and movement through the lifecycle with contact management, interaction tracking and pipeline management. They want to implement higher rates of automation into their sales process by automating workflows, sales force activity and marketing functions. And they want an integrated, all-in-one system that their users and customers can navigate easily. CRM vendors should consider focusing on buyer outreach and education in their sales process in order to reduce buyer confusion and make sure they’re giving customers exactly what they need. Buyers need to be proactive about gathering information on exactly what CRM software features they want so they can be correctly matched with the right CRM system for them. There is an obvious, significant market trend of buyers needing a comprehensive single software solution. While certain industry-specific software may be great for solving problems, buyers want to handle everything — marketing automation, contact management, email campaigns, reporting, analytics — on one platform. Integration and centralization were both in the top 11 most-requested CRM features, so vendors should be aware of this as they develop their products for 2019. Automation is in. From consistency in branding to more efficient workflows, buyers know they can be running better and smoother businesses. Automating marketing and other sales force tasks are becoming an expectation rather than a luxury, and within a few years any CRM system that doesn’t offer at least some basic marketing automation and sales force automation functionalities are going to be left in the dust. So will any business that don’t implement a CRM with these features. CRM software should help you make your business better, and that’s really all buyers want. Pretty good comprehensive list. I would like to throw another one for you to consider: ability of generating online surveys and having the data to get connected to the accounts in CRM. Having a customer survey module greatly helps for businesses to get a pulse on their customer experience delivery and also better understand voice of customer. That’s very insightful! That’s definitely a feature cutting-edge CRMs would be able to leverage as unique as most don’t include that kind of module yet. Getting your first CRM is a big step for your organization, congratulations on taking it! The first thing you’ll want to do is get your requirements in order — we have an interactive template that can help with that step. Once you know what features you need, you can compare vendors that specialize in those features — for instance, some are better for small business, some have a focus on sales force automation, etc. From that shortlist, I recommend pricing each vendor and finding the right combination of price and features. If you’re a bit daunted by that process, don’t worry! There are great tools out there to help you with the process. If you’d like even more guidance, SelectHub specializes in shortlisting vendors according to your needs and directing you to the perfect products. Feel free to get in touch with us! Hi, thanks for the great stuff. I wanted resources related to customer relationship management features. To find out what these useful articles are for the thesis I use. Please refer to the relevant articles. And if you’re looking for personal guidance, feel free to call us or live chat with our customer care team, we specialize in matching businesses to the right software for their needs! Hope this is helpful.